With your help, we can turn the tide on land loss. Through this plan we can ensure that horsemen and women everywhere are aware of the threat of land loss, are educated on what it takes to prevent it, and are supported in their efforts to conserve and protect their local horse lands for the benefit of generations to come! 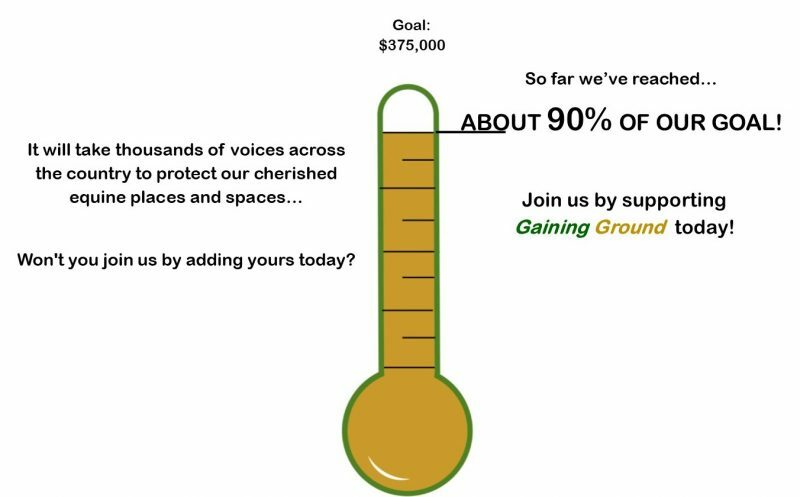 Please click here to learn more about Gaining Ground! HELP US MEET THE CHALLENGE! The good news is that we are well on our way to meeting our campaign goal of $375,000, with half of our goal reached to date but we need to raise the balance to achieve the goals laid out in our strategic plan. Two special donors have provided challenge grants to help us reach our goal. For every donation we receive during this special campaign that donation will be matched up to a total of $90,000.